Bangor (English: /ˈbæŋɡər/; Welsh: [ˈbaŋɡɔr]) is a city and community in Gwynedd, northwest Wales. It is the oldest city in Wales, and one of the smallest cities in the United Kingdom. Historically in Caernarfonshire, it is a university city with a population of 18,808 at the 2011 census, including around 10,500 students at Bangor University. It is one of only six places classed as a city in Wales, although it is only the 25th-largest urban area by population. At the 2001 census, 46.6% of the non-student resident population spoke Welsh. The origins of the city date back to the founding of a monastic establishment on the site of Bangor Cathedral by the Celtic saint Deiniol in the early 6th century AD. Bangor itself is an old Welsh word for a wattled enclosure, such as the one that originally surrounded the cathedral site. The present cathedral is a somewhat more recent building and has been extensively modified throughout the centuries. While the building itself is not the oldest, and certainly not the biggest, the bishopric of Bangor is one of the oldest in the UK. Another claim to fame is that Bangor allegedly has the longest High Street in Wales and the United Kingdom. Friars School was founded as a free grammar school in 1557, and the University College of North Wales (later Bangor University) was founded in 1884. In 1877, the former HMS Clio became a school ship, moored on the Menai Strait at Bangor, and had 260 pupils. Closed after the end of hostilities of World War I, she was sold for scrap and broken up in 1919. During World War II, parts of the BBC evacuated to Bangor during the worst of the Blitz. In June 2012 Bangor was the first ever city in the UK to impose a city centre wide night time curfew on under-16s. The six-month trial was brought in by Gwynedd Council and North Wales police, but opposed by civil rights groups. Bangor has been unique outside of England in using the title of 'city' by ancient prescriptive right, due to its long-standing cathedral. However, city status was officially conferred on it by the Queen in 1974. By means of various measures, it also is one of the smallest cities in the UK. Population of city council areas within the UK, is sixth. Bangor lies on the coast of North Wales near the Menai Strait which separates the island of Anglesey from Gwynedd unitary authority, the town of Menai Bridge lying just over the strait. The combined population of the two amounts to 22,184 people as of the 2011 census. Bangor Mountain lies to the east of the main part of the city, but the large housing estate of Maesgeirchen, originally built as council housing, is to the east of the mountain near Port Penrhyn. Bangor Mountain casts a shadow across the High Street, Glan Adda and Hirael areas, so that from November to March some parts of the High Street in particular receive no direct sunlight. Another ridge rises to the north of the High Street, dividing the city centre from the south shore of the Menai Strait; this area is known as Upper Bangor (Bangor Uchaf). 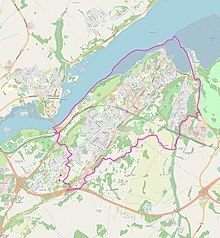 Bangor has two rivers within its boundaries. The River Adda is a largely culverted watercourse which only appears above ground at its western extremities near the Faenol estate, whilst the River Cegin enters Port Penrhyn at the eastern edge of the city. Port Penrhyn was an important port in the 19th century, exporting the slates produced at the Penrhyn Quarry. Bangor railway station is located on the North Wales Coast Line from Crewe and Chester to Holyhead. The A55 runs immediately to the south of Bangor, providing a route to Holyhead and Chester. The nearest airport with international flights is Liverpool John Lennon Airport, 83 miles (134 km) by road. Bangor lies at the western end of the North Wales Path, a 60 miles (97 km) long-distance coastal walking route to Prestatyn. Bangor is on routes NCR 5, NCR 8 and NCR 85 of the National Cycle Network. Classical music is performed regularly in Bangor, with concerts given in the Powis and Prichard-Jones Halls as part of the university's Music at Bangor concert series. The city is also home to Storiel (the new name for the Gwynedd Museum and Art Gallery). A new arts centre complex, Pontio, the replacement for Theatr Gwynedd, was scheduled for completion in the summer of 2014, but the opening was delayed until November 2015. 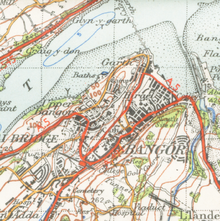 Bangor hosted the National Eisteddfod in 1890, 1902, 1915, 1931, 1940 (through the medium of radio), 1943, 1971 and 2005, as well as an unofficial National Eisteddfod event in 1874. Garth Pier is the second longest pier in Wales, and the ninth longest in the British Isles, at 1,500 feet (460 m) in length. It was opened in 1893 and was a promenade pier, for the amusement of holiday-makers who could stroll among the pinnacle-roofed kiosks. In 1914 it was struck by a vessel that had broken free of its moorings. The damaged section was repaired temporarily by the Royal Engineers, but when in 1922, a permanent repair was contemplated, it was found that the damage was more severe than had been thought. The repairs were made at considerable cost and the pier remained open until 1974 when it was nearly condemned as being in poor condition. It was sold for a nominal price to Arfon Borough Council who proposed to demolish it, but the County Council, encouraged by local support, ensured that it survived by obtaining Grade II Listed building status for it. When it was listed that year, the British Listed Buildings inspector considered it to be "the best in Britain of the older type of pier without a large pavilion at the landward end". Restoration work took place between 1982 and 1988, and the pier was re-opened to the public on 7 May 1988. In November 2011, essential repair work was reported to be required, the cost being estimated at £2 million. A grant from the Heritage Lottery Fund was sought but the application was rejected. The Cathedral Church of St Deiniol is a Grade I Listed building and is set in a sloping oval churchyard. The site has been used for Christian worship since the sixth century but the present building dates from the twelfth century. It has a two-bay chancel, transepts, a crossing tower, a seven-bay nave and a tower at the west end. The Archdeacon's House in Bangor was the setting for act 3, scene I of William Shakespeare's Henry IV, Part 1. Bangor has a central shopping area around the High Street, and retail outlets on Caernarfon Road, on the outskirts of the city. One of these is St. David's Retail Park, built on the site of the demolished St David's maternity hospital. In 1865, Morris Wartski, a refugee from the Tsarist pogroms, first established a jewellery business on Bangor's High Street, and then a drapery store. His son, Isidore, went on to develop the drapery business and to create a large, fashionable, store. He also redeveloped the Castle Inn on High Street in Bangor, which then became the high-class Castle Hotel. Wartski was a very popular mayor of the city and a great patron of local sports and charities. Wartski Fields were bequeathed to the city and people of Bangor by his widow, Winifred Marie, in memory of Isidore Wartski. Gwynedd is the most Welsh-speaking county in Wales, with 65.4% of people saying they could speak it at the 2011 Census, although Bangor has been significantly more Anglicised than its hinterland and the rest of Gwynedd, mostly because of the large student population. While nearby towns in Gwynedd, such as Bethesda and Caernarfon were still 75-80% Welsh speaking in 2011, Bangor was already only 53.4% Welsh speaking as early as 1971. The city has long been the most cosmopolitan settlement in Gwynedd, attracting incomers from both England and further afield, with Bangor University being a key institution. At the 2011 Census, 49.3% of Bangor's population was born outside Wales. Nevertheless, Welsh was the majority vernacular of the town in the 1920s and 1930s; at the 1921 Census, 75.8% of Bangor's inhabitants could speak Welsh with 68.4% of those aged 3–4 being able to, indicating that Welsh was being transmitted to the youngest generation in most homes. The 1931 Census showed little change, with 76.1% of the overall population being able to speak Welsh. Bangor University and Coleg Menai are located in the city. Secondary schools include Ysgol Friars, Ysgol Tryfan and St. Gerard's School. There are also a number of primary and infant schools. Ysbyty Gwynedd is located in Bangor in the suburb of Penrhosgarnedd. It has 432 beds, making it smaller than the other district general hospitals in Betsi Cadwaladr University Health Board (after Wrexham Maelor Hospital with 629 beds and Glan Clwyd Hospital near Rhyl with 466 beds. Bangor has a long-established football team, Bangor City F.C. which competes in the national Welsh Premier League (formerly League of Wales). Bangor City have won this league on three occasions (1994, 1995, 2011) and been continuous members of the league since its inception. Bangor City have also won the Welsh Cup eight times, most recently in the 2010 competition. Before 1992 they were members of the English football pyramid, peaking with the Northern Premier League title in 1982 and being FA Trophy runners-up in 1984. They have also competed in the UEFA Cup Winners' Cup three times (including its final season, 1998-99, before being merged into the UEFA Cup), UEFA Champions League twice, and UEFA Cup five times, though they have not progressed far in any of the European competitions. Many Bangor fans have been seen to have anger towards the Welsh FA for forcing Bangor into the Welsh Premier League when there are other Welsh teams in the English pyramid system. Bangor is also home to rugby union team Bangor RFC who play in the WRU Division Two North league. As well as the city's team, the university boasts a very competitive rugby union team, of which won the title in its BUCS league in mid 2016. Bangor is home to a small BBC broadcasting centre, producing a large amount of output for BBC Radio Cymru. The studios are also the main North-West Wales newsroom for television, radio and on-line. The BBC's Light Entertainment Department moved to Bangor during World War II and many classic programmes (like It's That Man Again) came from Bangor. Bangor was also previously home to two commercial radio stations, Heart Cymru (serving Anglesey and Gwynedd) and the now-defunct Heart North Wales Coast (serving the North Wales Coast), which shared studio facilities on the Parc Menai office complex - the studios were closed in August 2010 after the stations were moved to Wrexham. Bangor University also has its own student radio station called Storm FM, which broadcasts to the Ffriddoedd Site and from their website. In 1967, The Beatles came to Bangor, staying in Dyfrdwy, one of the halls comprising Adeilad Hugh Owen (Hugh Owen Building), now part of the Management Centre, for their first encounter with Maharishi Mahesh Yogi, during which visit they learned of the death of their manager Brian Epstein. On 24 February 2010 BBC Radio 1's The Chris Moyles Show announced Bangor as the location for Radio 1's Big Weekend concert festival. The morning show was broadcast on location from Bangor, with the announcement as well as a portion of the lineup being revealed. Big international acts such as Rihanna, MGMT, Kesha and Alicia Keys played as well as homegrown British acts like Biffy Clyro, Pixie Lott, Cheryl Cole, Pendulum and Dizzee Rascal. Bangor lies within the Arfon constituency for elections to the UK parliament. Arfon is also the constituency for elections to the National Assembly for Wales. The City of Bangor Council serves the people of the city, created in 1974 following Bangor assuming city status. Twenty councillors are elected from the eight electoral wards in the city, namely: Deiniol (2), Dewi (3), Garth (2), Glyder (3), Hendre (2), Hirael (2), Marchog (3) and Menai (3). In 2017 half of the seats were won by Plaid Cymru. The city also elects eight county councillors to Gwynedd Council. The Community of Pentir adjoins the city. Errie Ball (1910–2014), golfer, played in first Masters Tournament in 1934. Duffy, singer-songwriter. First Welsh woman to achieve number one on the UK Singles Chart since 1983. John Edward Daniel, theologian and Plaid Cymru political leader. Matthew Dent, graphic artist and designer of the redesigned 2008 British coinage. Cai Griffiths, rugby player playing for London Welsh. Wayne Hennessey, footballer (goalkeeper) playing for Wales & Crystal Palace FC. Owain Tudur Jones, professional footballer. Angus McDermid, BBC News foreign correspondent. Eddie Niedzwiecki goalkeeper and professional footballer. Sasha, DJ and record producer. Alex Thomson, record-breaking solo around-the-world sailor. John Francon Williams FRGS (1854 - 4 September 1911) editor, journalist, writer, geographer, historian, cartographer and inventor. Williams was born in Llanllechid and lived in Bangor during his childhood. Gwilym Simcock, pianist and composer. ^ Wade-Evans, Arthur. Welsh Medieval Laws. Oxford Univ., 1909. Accessed 31 Jan 2013. ^ "Bangor and the area". University of Bangor. Retrieved 15 December 2015. ^ "It's 9.01pm in Bangor. Do you know where your children are? (If not, they might be locked up)". The Independent. London. 19 June 2012. Retrieved 27 November 2017. ^ Official Labour Market Statistics, Nomis. "Custom report - Bangor". www.nomisweb.co.uk. ^ "Bryn Terfel: Pontio theatre named after opera star in Bangor". bbc.co.uk. 11 October 2013. Retrieved 28 November 2013. ^ "Pontio centre opens its doors to the public in acrobatic 'Welcome Day'". bbc.co.uk. 29 November 2015. Retrieved 10 January 2016. ^ a b "Bangor Garth Pier, North Wales". The Heritage Trail. Retrieved 30 April 2016. ^ "Bangor Pier, Garth Road, Bangor". British Listed Buildings. Retrieved 30 April 2016. ^ "Bangor Pier". National Piers Society. Retrieved 20 February 2012. ^ "Cathedral Church of St Deiniol, Bangor". British Listed Buildings. Retrieved 30 April 2016. ^ "SCENE I. Bangor. The Archdeacon's house". ^ "Welsh speakers by electoral division, 2011 Census". Welsh Government. ^ "Welsh-Speaking in Wales According to the 1971 Census". JSTOR 20000922. ^ a b Internet Memory Foundation. "ARCHIVED CONTENT UK Government Web Archive – The National Archives". ^ a b c d "Cyfrifiad: Niferoedd y siaradwyr Cymraeg wedi disgyn". Golwg360. ^ "Ystadegau am iaith disgyblion, Ionawr 2014 a 2015 - a Freedom of Information request to Welsh Government". WhatDoTheyKnow. 11 September 2015. Retrieved 25 November 2016. ^ info@histpop.org. "HISTPOP.ORG - Search > Results > Counties of Carnarvon and Anglesey, 1921 Page Page i". www.histpop.org. ^ info@histpop.org. "HISTPOP.ORG - Search > Results > County of Anglesey and Caernarvon (Part I), 1931 Page Page xxii". www.histpop.org. ^ "Schools – Gwynedd Council". gwynedd.gov.uk. Archived from the original on 4 January 2011. Retrieved 18 July 2010. ^ "NHS beds by organisation and site". wales.gov.uk. ^ "Bangor and the Beatles". Bangor University. Archived from the original on 11 December 2014. Retrieved 27 October 2014. ^ "The Beatles in Bangor". BBC Wales. 2 September 2009. Retrieved 27 October 2014. ^ "History Of The Council". Bangor City Council. Retrieved 25 November 2017. ^ "The City Council". Bangor City Council. Retrieved 25 November 2017. ^ "Ball, the Last Master Standing, celebrates 100th birthday". Professional Golfers' Association of America. 16 November 2010. Retrieved 21 June 2018. Wikimedia Commons has media related to Bangor, Gwynedd. Wikisource has the text of the 1911 Encyclopædia Britannica article Bangor (Carnarvonshire). This page was last edited on 22 April 2019, at 18:51 (UTC).